Mason Mount going back to the day job, Josh Wright discusses Bradford's problems and Macclesfield could make unwanted history. It must have been a whirlwind week for Mason Mount, having spent the past few days travelling from Croatia to Spain watching England play in two fascinating Nations League clashes, albeit fascinating for different reasons. While the 19-year-old may have been disappointed not to get onto the pitch and win his first cap, he must now quickly switch his focus back to the Sky Bet Championship and ensure Gareth Southgate does not forget about him before the next international break. "You see things in the media but, for me, I try not to look at that kind of stuff, try not to get distracted. I just focus on my football," said Mount, according to the Derby Telegraph. "The main thing is performing on the pitch. You focus on that, doing the best you can. You never know what can happen." There will be more attention than ever on Mount but he does not seem like the type to get distracted by the hype. Derby host leaders Sheffield United on Saturday evening, live on Sky Sports Football, giving the midfielder another chance to show the England manager and the watching world why he should win his first cap next time around. Tyler Roberts may consider himself a little unlucky to be losing his place this weekend if Kemar Roofe is fit enough to return and start for Leeds, but there is little doubting that Marcelo Bielsa's team are a better team with Roofe in the side. Leeds have been without Roofe for six games now and they have dropped from the top of the Sky Bet Championship to third. In their first six games they won four, since there have been just two wins. They scored 14 goals in their first six and have netted just eight since. Interestingly, Leeds have been taking almost three shots more per game on average without Roofe, although that could be to do with the fact they work the ball less into the final third in his absence. Leeds have a tough trip to Blackburn at midday on Saturday, live on the red button on Sky Sports Football and on the Sky Sports mobile app, where Roofe and Pablo Hernandez, who is also returning, can help them get back to the form they showed at the start of the season. What an afternoon it promises to be for Dean Smith. 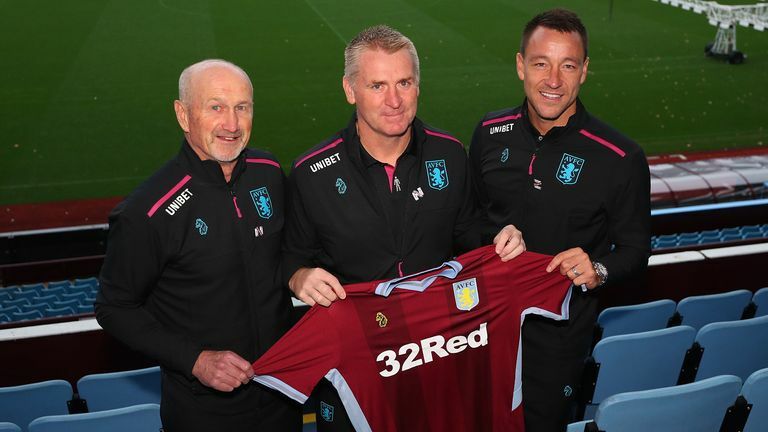 Every football fan dreams of pulling on the jersey of their boyhood club and, while that may not have happened for him, being able to manage Aston Villa must be a very close second. Smith is a professional, though, and will put emotion to one side when they host Swansea at Villa Park on Saturday. Villa are 15th in the Sky Bet Championship, just six points above the relegation places, yet Smith believes he can guide the club back to the Premier League right away. "The statistics are not good for the club at the moment, hence why I'm sat here," said the former Brentford boss, speaking at his first Villa press conference on Monday. "There is a realistic aim, I believe, to go and get promoted this season." The fact remains Smith has inherited the same unbalanced squad Steve Bruce was trying to guide to promotion, and you feel John Terry would be as valuable right now in the heart of their defence as he would in the corner of the dugout. If he can get the best out of them, though, then there's no doubt Tammy Abraham, Jack Grealish and Co have the quality to get Smith off to the perfect possible start. It's been a terrible start to the season for Bradford. Just three wins and 10 points so far have seen them drop into 22nd in the Sky Bet League One table, when they should really be targeting promotion in this division. They are already onto their second manager of the season, having dispatched Michael Collins after just six games, and their fourth permanent appointment of 2018, David Hopkin, is already under pressure as their form has failed to pick up. Bradford captain Josh Wright and Don Goodman join David Prutton in this week's EFL Matters. "It has been tough," admitted club captain Josh Wright, as he appeared on EFL Matters on Thursday. "We've not had enough wins or put enough points on the board. We are into October and we're onto our second manager, which makes it even tougher, but as a group we know we have to keep going and digging in. "We're a big club in this division and we should be doing better than what we are. We are working day in, day out to put things right at the moment and that's all we can keep doing, then hopefully the wins will come." Saturday brings Rochdale to Valley Parade. Dale are sitting in 16th in the table but have more points away from home than any other side outside the top nine. This will be another tough appointment for the Bantams. It seems cruel to pick on lowly Macclesfield again, having also mentioned their Sky Bet League Two struggles in the last Five Things column before the international break, but it is impossible to ignore the fact they could make proper English football history this weekend - albeit of the unwanted kind. When Macclesfield lost at Tranmere last Friday night they equalled the record of most league games in a row with victory (36), and a failure to beat Carlisle on Saturday would see them go out on their own ahead of Derby's 'Class of 2007-08' with 37. One caveat for Macclesfield would be this run began in 2012 and was split in half by a lengthy stint outside of the Football League, whereas Derby's were all consecutive and in either the Premier League or the Championship. Gary Simpson was the last manager to get a win in the Football League with Macclesfield way back in 2012. "2011/12 to now is a massive gap to get back," he said, in an interview that you can see from 12pm on Soccer Saturday. "What John Askey did was fantastic [before he left in the summer] and I had never even thought that I was the last man who won a league game. "They've been a bit unlucky this season conceding late goals and such. Fingers crossed they might get a result on Saturday."